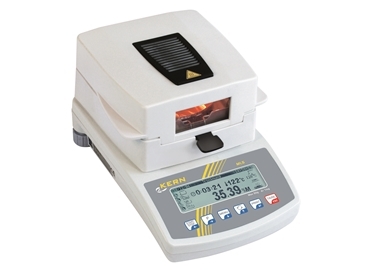 Now available from John Morris Scientific , Kern’s moisture analysers provide quick and accurate solutions for moisture content, percent solids and dry weight analysis of a range of products and materials. Kern offers three types of moisture analysers, the MLB being the most basic model. The MLB moisture analyser features an LED screen which displays temperature, drying percentage and drying time. The shutdown criteria can be set to automatic - if the results do not alter during three strobe intervals. Strobe intervals can be set from 1-59 seconds or manually set according to a desired time. The MLB 50-3 heats from 50ºC - 160ºC in 1ºC stages. The MLS series of moisture analysers have four heating profiles. These are, preheating, standard heating, gradual drying and stage drying. It has a memory which can hold up to 99 drying processes. The MLS 50-3HA160 and MLS 50-3HA250 both feature rapid halogen heating from 50ºC with the former reaching a maximum temperature of 160 ºC and the latter reaching 250ºC. The MLS 50-3IR160 on the other hand features infrared heating and is ideal for more sensitive samples. With a temperature range of 50ºC -160 ºC the MLS 50-3IR160 moisture analyser infrared heating technology, which is slower than halogen heating, however it reduces the need for replacing halogen bulbs and prevents the overshooting of the set temperature. The final type of Kern moisture analyser available is the MRS, which has an extended weighing range up to 124g. It is used as a quick and reliable means of determining the moisture content in powders and liquids by the thermo-gravimetric principle. The MRS120-3 features a halogen quartz heater with a temperature range of 30ºC - 230ºC. Throughout the analysis the balance displays the current status in accordance with the chosen parameters, keeping the operator up to date on each stage of the process. The analysis automatically terminates either when the drying is complete and the dry weight is stable, or after a fixed time specified by the operator.